Welcome to the February 2017, edition of the Hillsborough Street Renewal, a monthly e-newsletter keeping businesses and residents along the corridor up to date on Phase II construction news. Duke Energy Progress (DEP) has removed a good number of power poles along the south side of Hillsborough Street. The removal of these poles allows Pipeline Utilities Inc. crews to install the storm drain system between Gardner Street and Brooks Avenue, and for the hardscaping along the south side of the street to move forward. Crews have started construction on the new sidewalks along the south side of Hillsborough Street. To date, you can see new concrete sidewalk near SubConscious and new brick paver sidewalk in front of the 2811 Building. 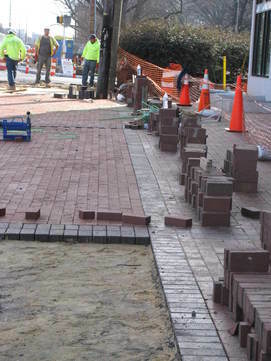 Currently, crews are working on the brick paver sidewalk from the 2811 building running east towards Brooks Avenue. Crews are also installing new curb and gutter along the south side of the street, and have poured some driveway aprons and handicap curb ramps at different locations along the corridor. You can see new driveway aprons in front of Zaxby’s and near SubConscious and a new retaining wall in front of the Fincastle Apartments on the east side of Rosemary Street. Private utility companies are still working along the corridor. Presently, PSNC has subcontractors relocating gas lines on Dixie Trail, and the subcontractor for DEP continues transferring overhead utilities to the newly installed underground conduit system west of Dan Allen Drive running towards Friendly Drive. Some critical utility work is scheduled for this week and next week during the overnight hours. 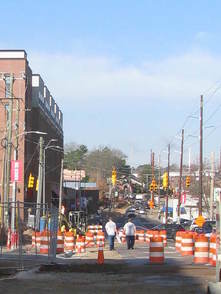 Hillsborough Street is scheduled to be closed Sunday night through Thursday night while crews work on various tasks. This week Carolina Conduit Systems installed electrical and cable duct bank across Hillsborough Street in front of SubConscious, at Concord Street, and at Bagwell Avenue. Pipeline Utilities ran stormwater pipes across Hillsborough Street at the Rosemary and Shepherd Street intersection. DEP removed two poles on Shepherd Street, and PSNC ran a gas line across Hillsborough Street. This night work was an excellent example of teamwork. All these different crews worked together along the corridor utilizing the road closure instead of having to put the same road closure in place for each task. There will be another temporary traffic pattern put in place within the next couple of weeks. 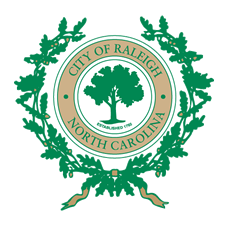 Crews will install a new sanitary sewer main that runs down the middle of Hillsborough Street between Dixie Trail and Concord Street. Westbound traffic will shift to the north side of the roadway, and eastbound traffic will shift to the south side of the roadway with concrete barriers partitioning the center of the roadway while the sewer in that location is replaced. Crews will continue to install the storm drainage system between Brooks Avenue and Gardner Street, and the hardscaping is scheduled to continue along the south side of the street. In the late spring, contractors anticipate switching their construction efforts to the north side. There are a good number of businesses along the north side, and we encourage businesses and residents to attend the upcoming Coffee Talk on March 14, at 10 a.m. at the Stanhope. At this time we will have the traffic control plan available for the public to see, and our Project Manager, Richard Dickie will talk about the upcoming construction on the north side and what can be expected. We will also be available to answer questions and hear your concerns, so please mark this meeting on your calendar.